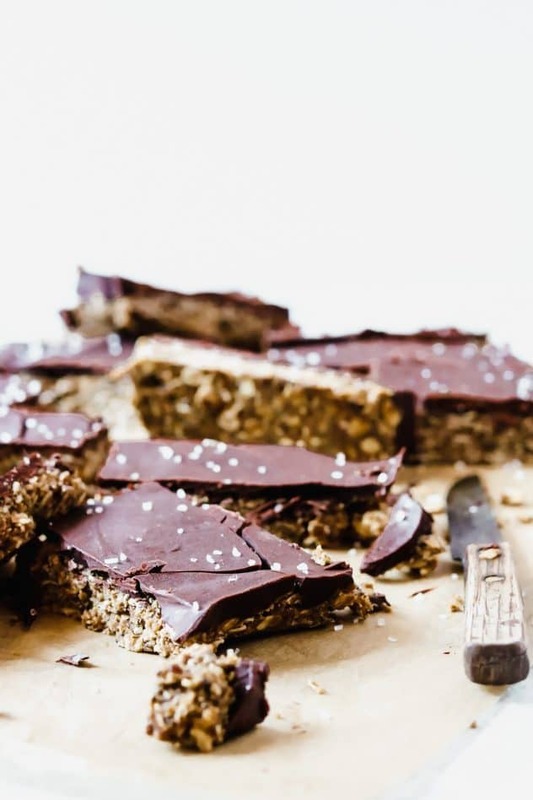 A chewy, nut-free chocolate granola bar using sunbutter; the perfect on-the-go snack. If you’ve been with me since the beginning, you know that Wanderlust and Wellness actually began as a solution to my nut-allergy. I was frustrated with so many ‘healthy’ recipes always including some form of nut-based ingredients like nut flour, butter, or milk. I decided to start creating my own recipes that were 100% nut-free for others that may have a serious nut allergy like me (except for pecans, I can actually eat pecans). 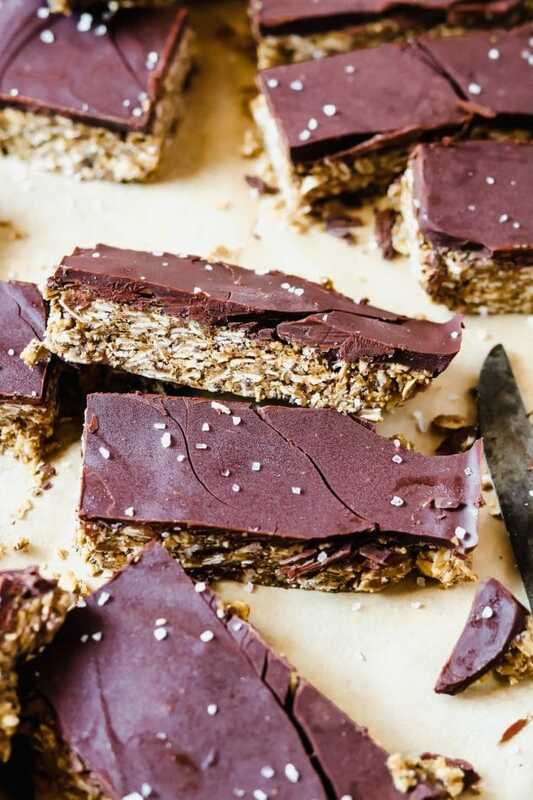 These sunbutter chocolate granola bars are the perfect option for a quick and easy healthy snack minus any nut-based ingredients. 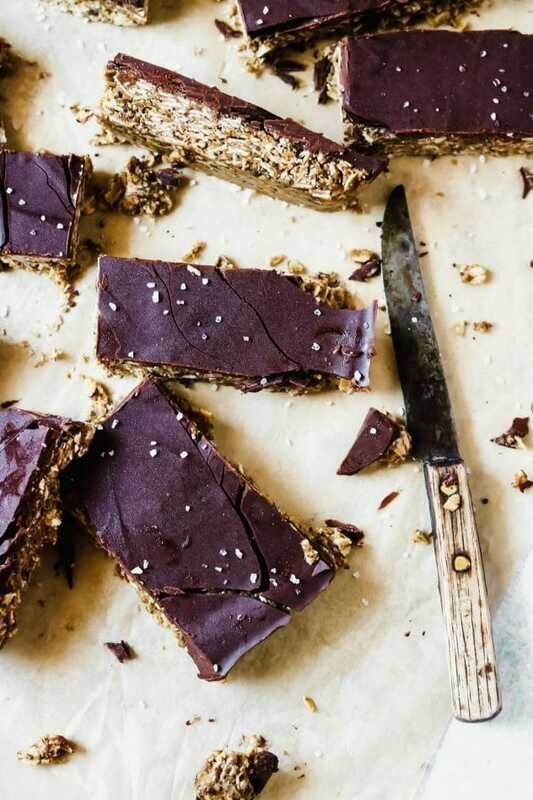 The chewy granola bar is packed with ingredients like medjool dates, oats, and chia seeds. 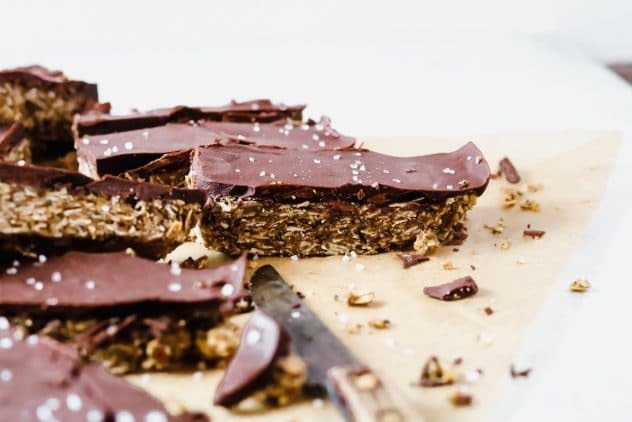 For the top chocolate layer, you can choose your own chocolate, semi-sweet or dark, or you can even go with a dairy-free option like Enjoy Life Food’s dairy-free chocolate. You’ll find that almost all of my recipes are versatile in order to accommodate food intolerances and allergies. Of course, if you don’t have a nut-allergy you can always just use your favorite nut butter. You’ll notice the chocolate is cracked in these pictures, and I’m okay with that. I wanted the chocolate to be firm and crunchy, so I froze them before cutting. If you prefer, you can freeze, then bring them up to room temperature before cutting, it’s totally up to you. It’s been so long since I’ve had a chocolate peanut butter granola bar, that biting into one of these took me back to my childhood before my nut allergy reared its ugly head. 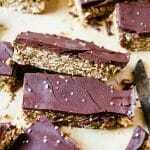 I also thought these sunbutter chocolate granola bars tasted almost identical to chocolate no-bake cookies! Add the pitted dates, sunbutter, maple syrup, and vanilla to a food processor and process until smooth and combined. Transfer mixture to a large mixing bowl. Add the oats and chia seeds and stir by hand until well-combined. Line an 8×10 baking dish with parchment paper. Transfer granola bar mixture to pan and using a rubber spatula or wooden spoon spread and flatten the granola mixture into the pan. In a small saucepan, add the chocolate chips and coconut oil. Melt chocolate over medium-low heat, stirring frequently. Once completely melted, spread over the top of the granola mixture. Cover with plastic wrap and let sit in the freezer for at least 30 minutes. Remove from freezer once the chocolate is firm. 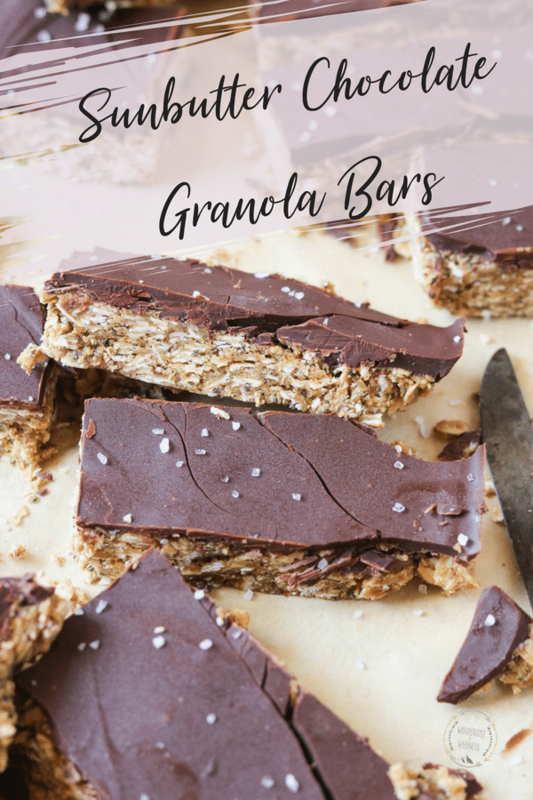 Using a sharp knife, cut the granola mixture into bars and serve.